Tag line: "Unchanged men in a changing land. Out of step, out of place and desperately out of time." "The outlaws of the west have always fascinated me”, director Sam Peckinpah once said, “They were strong individuals. In a land for all intents and purposes without law, they made their own”. In The Wild Bunch, we meet a few of these "strong individuals", and, along the way, discover that the ability to make your own laws doesn't necessarily equate to freedom; in fact, the opposite can be true. Having known nothing but lawlessness for many years, these characters are now trapped, unable to break free of the lives they've created for themselves. In the days leading up to World War I, an aging gang of outlaws, under the leadership of Pike Bishop (William Holden), sets out to rob a Texas bank, a heist they hope will provide a pay-off bug enough to fund their retirement. But when the robbery is foiled by Pike’s old partner, Deke Thornton (Robert Ryan), a former outlaw who’s been hired to bring his 'associates' to justice, Pike and his gang, which includes his good friend, Dutch (Ernest Borgnine), and the Gorch brothers, Lyle (Warren Oates) and Hector (Ben Johnson), are forced to make other arrangements. With no money and little opportunity to obtain any in America, they ride south of the border, where they're able to land a job stealing guns for a General known to his people as Mapache (Emilio Fernández). Mapache is a violent military leader bent on gaining control of all of Mexico, and lacks only the firearms to make it happen. But when Mapache changes the terms of their agreement, Pike and his men decide it's time to give the General a taste of his own medicine. Through bloody violence and a raw depiction of life on the run, Peckinpah's The Wild Bunch single-handedly deglamorizes the American West, stripping away the mythology of righteousness that was forged for decades in the furnace of Hollywood. In its place, we're left with the brutal reality of a land without order, where trust and honor are a rare commodity. For the aging outlaws in The Wild Bunch, who've grown tired of killing, tired of running, and tired of a west that has afforded them no peace whatsoever, there is little honor to be found, no freedom to comfort them. There is only the cold reality that falling asleep with a gun in your hand isn't a precaution; in this land, it's a necessity. I've only recently begun to appreciate the changes that took place during the 1960s in American cinema. Peckinpah's style and care for all the bloody details is spectacular. Klaus: Thanks for the comment. 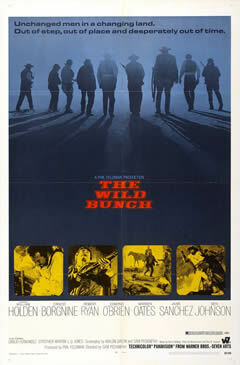 THE WILD BUNCH was an influential film in many respects, notably its use of violence. It's Peckinpah's best film, and arguably one of the greatest westerns ever made.